Pressed for time? 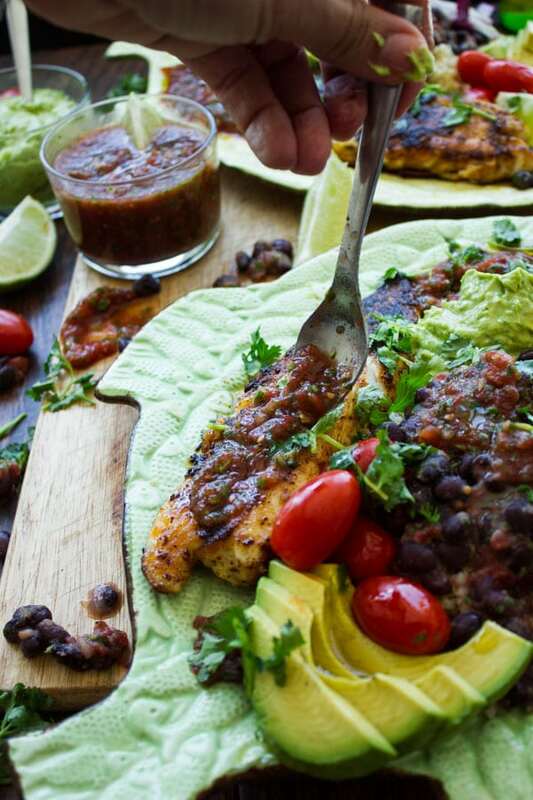 This Mexican Tilapia Fish Dinner with Mexican black beans, homemade guacamole, and restaurant-style salsa comes together in just 30 minutes and is healthy, nutritious and outrageously delicious! 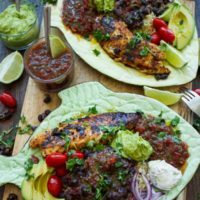 This 30 mins Mexican tilapia fish dinner recipe is one of those last minute dinner meals that is packed with flavor! It’s absolutely delish and a total crowd pleaser you can make with minimal effort! Tilapia Fish is a fresh water fish and has a clean taste. It’s usually farmed unfortunately and has come under some bad press for farming practices in China. So rather than looking for wild Tilapia (because it’s very rare), look for Tilapia raised in the US and other countries. Tilapia Fish is loaded with minerals, protein and omega 6. What I love most about tilapia however is it’s easily spiced and doesn’t have any “fishy” taste whatsoever. Tilapia fish takes on any spice blend or topping beautifully, so the sky’s your limit—something simple like this Quick Zesty Herb Tilapia is an example or something fancier and richer in flavor yet still simple, like this Pesto Pistachio Fish Fillet. You can even go bold with a tandoori spice, or stick to my Mexican spice. Basically garlic, lime and chilli spice. And that’s it. Sear the fish on each side for 6-7 mins and you’re done! In brief, Is Tilapia Good For You? The answer would be YES if you can source it from anywhere but China and if you don’t eat too much of it! 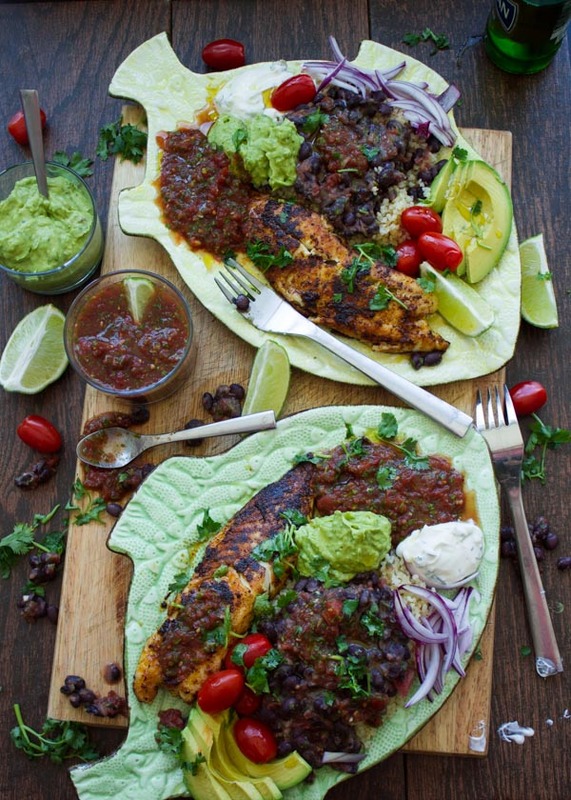 You’ll devour this 30 mins pan-fried tilapia fish recipe because it’s packed with Mexican flavor! And it’s a total crowd pleaser you can make with minimal effort! The best thing is that you can play around with various toppings and any grain you want, add some tortilla chips, a chopped salad – whatever you are craving. It’s one of those ultra satisfying dinner plates with condiments that will make you wanna double and triple your servings! Since tilapia fish cooks very fast, you’ll find it a go to choice when you’re rushed for weekdays dinners. You can play around with toppings and grains, add some chips, salad, and make this a different version every time. It’s one of those ultra satisfying dinner plates with condiments that will make you wanna double and triple your servings! Every time I’m up for something Mexican-inspired, I pull out my favorite gadget: Yes, my food processor. I end up making salsas, guacamole or avocado dressing in minutes—and what a difference to the final meal those few mins make! It’s day and night. One of my favorites is this Quickest Chicken Fajita with Mango Pineapple Salsa, or this Mexican Style lentil Detox salad . Seriously just a few minutes. For today’s Mexican infused tilapia fish dinner plate, I made my favorite restaurant Style Mexican Salsa and my favorite classic Mexican guacamole. Disclaimer—I absolutely hate the photos I took for this Classic Mexican guacamole recipe. So delish though! The tilapia fish is seasoned with simply garlic, chilli powder and salt. That’s really all you need to make this plate shine. 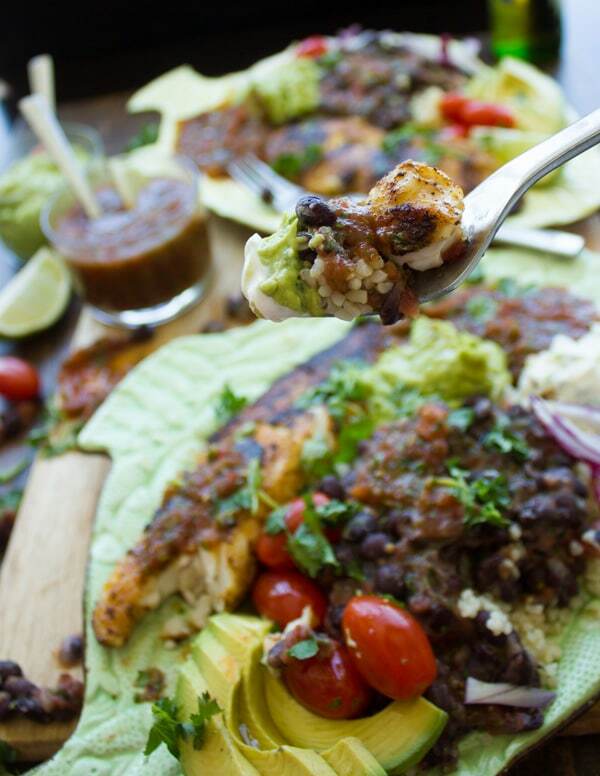 It’s also the ONLY way I make my Tilapia Fish Tacos recipe–same blend! Now pan sear the fish in some oil for 5 minutes per side and your fish is ready! My final additions to this recipe are a type of grain and beans. For the grain—I tried to stay away from rice so I used whole wheat bulgur. Any type of grain works beautifully here—quinoa, millet, buckwheat if you’re gluten-free (or not), or something like faro, couscous, pearl couscous. Anything you have on hand. And for the record, the grain is completely optional. As for the beans. This is my favorite shortcut to speedy refried style beans, I mash up roughly some black beans using a fork (very roughly) and then toss them with a pinch of salt and my favorite Restaurant style Mexican salsa. This also makes an amazing bean topping to load up your nachos with! Finally, I just assemble my tilapia fish recipe plate by piling up some grain, topping it with my fancy speedy bean mixture, more salsa on top, guacamole on the side, my succulent pan-fried tilapia, more salsa, maybe a dollop of sour cream, forks and a BIG smile on my face!!! Make sure to really rub the spice mixture into the fish for maximum flavor. Homemade salsa and guacamole taste best (use my recipes) but you can use store-bought as a shortcut. Serve this pan-fried tilapia with any grain or legume you like. 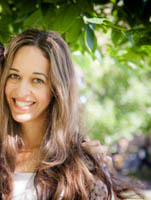 Quinoa, brown rice, lentils, farro, white rice or bulgur – anything goes. 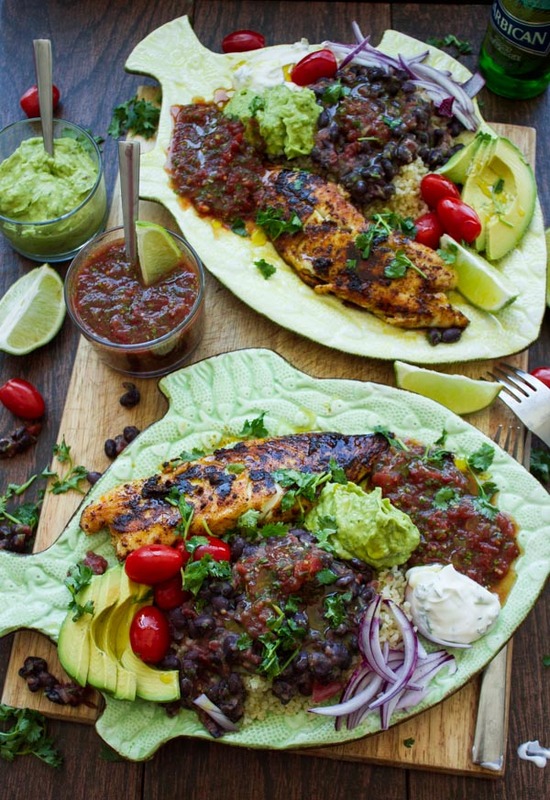 It’s best to eat the dinner plate as is the same day, but use leftover tilapia for fish tacos or salad! The bean mixture also makes the best nachos! Using a food processor, prepare the Restaurant style Mexican Salsa and the guacamole. Toss the fish fillets with all ingredients except for the olive oil. Rub the spice, garlic and lime well into each fillet for utmost flavor. Heat up a skillet over medium-high heat with the olive oil, and when hot, add the tilapia fish. Let the fish sear on one side for 6 mins, flip the fillets and let them cook for another 6-7 mins, and then flip them one last time. Turn off the heat, cover the pan and let the fish stay in the pan for 2-3 mins more (this ensures perfect done-ness). In the meantime, prepare the bean mixture. Mash up the black beans roughly using a fork in a bowl, season them with salt, and toss them with the salsa mixture while gently mashing to your desired texture. Assemble the plate by mounding some cooked grain, seed or lentils, top them with the bean mixture, and top that with more salsa. 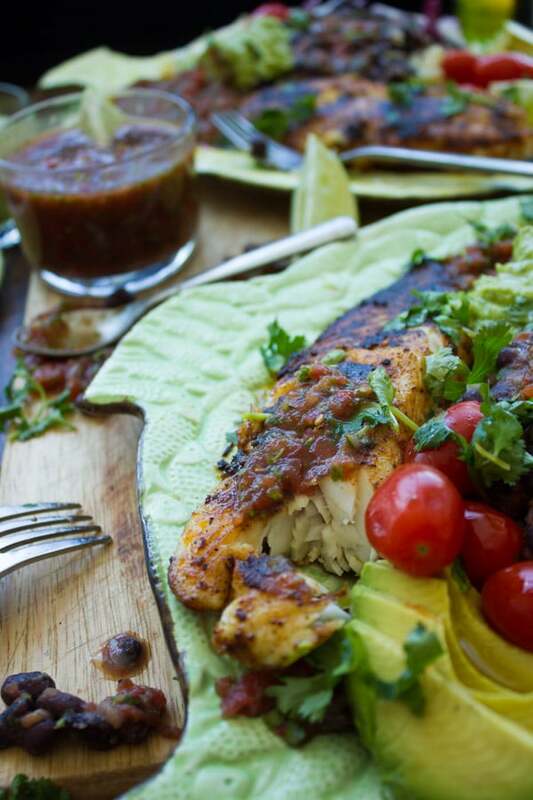 Place the fish fillet next to it and then surround it with some salsa, guacamole and your favorite condiments. Enjoy! Homemade salsa and guacamole taste best (use my recipes) but you can use store-bought as a short cut. Serve this pan-fried tilapia with any grain or legume you like. Quinoa, brown rice, lentils, farro, white rice or bulgur - anything goes. 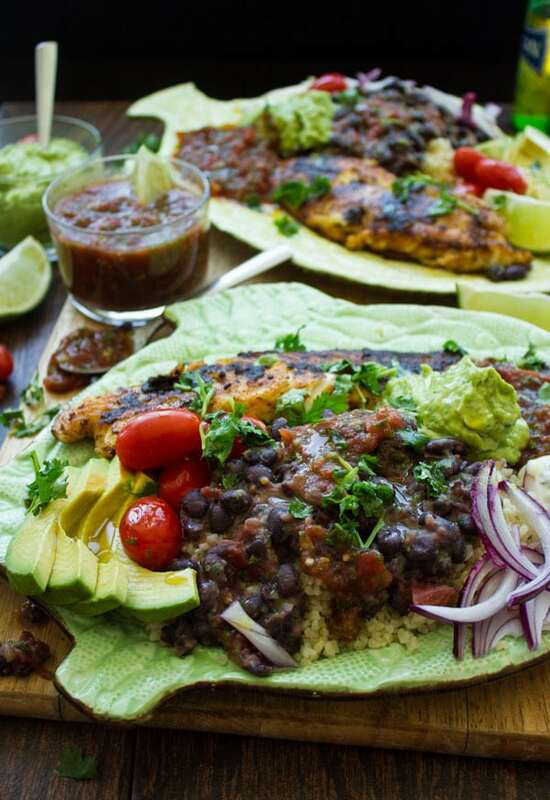 It's best to eat the dinner plate as is the same day, but use leftover tilapia for fish tacos or salad! I’ve never tasted Tilapia in my life, but I have to say this one looks so delicious. I wonder if we can prepare it with saltwater fish though. Try it with another type of fish! Very delicious, while also being light and healthy – definitely highlights the flavor of the fish in subtle way. Such an amazing dish!! 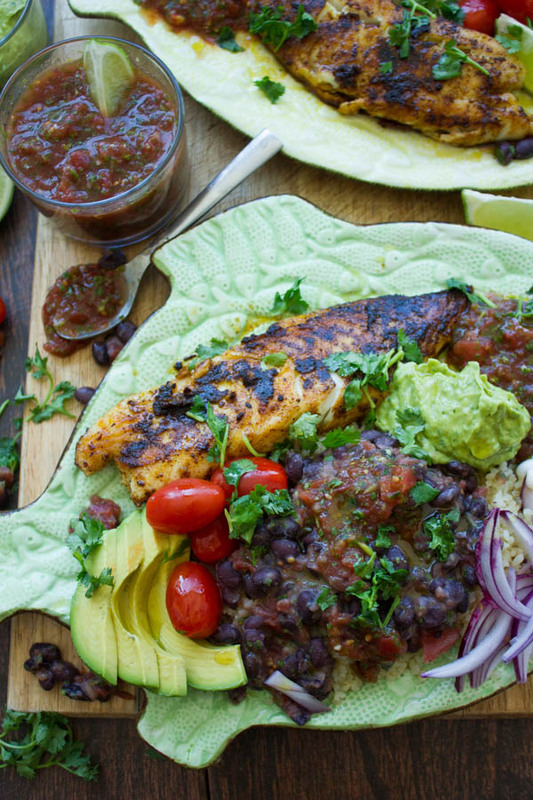 The Tilapia looks incredibly delicious! This was such a great dinner! So easy and delicious. glad you enjoyed it Sabrina! Tilapia is my favorite fish. This is definitely a must try recipe! I can’t believe how gorgeous these plates are! LOVE IT! hahahah everyone loves the plates!